The Tom Clancy’s Ghost Recon® Wildlands development team is dedicated to providing optimal conditions for players to execute their missions. As early as in the game’s alpha stage, we have developed dedicated tools and internal processes to ensure a fair game environment. With the Ghost War Open Beta coming, we are going one step further with the improvement of our reporting tools, measures taken against match quitters, and, of course, anti-cheat. As for the campaign mode, we will not tolerate cheating of any kind in Ghost War, making the fight against cheaters one of our top priorities. Tom Clancy’s Ghost Recon Wildlands uses a variety of solutions to detect cheats or unauthorized modifications of the game, with EasyAntiCheat being the primary one. Since the launch of the game in March, 2017, more than 1,300 players have been banned by EAC, ensuring a fair experience for all the Ghosts operating in our fictional representation of Bolivia. For more information about how cheating and banning work for Tom Clancy’s Ghost Recon Wildlands, please read the dedicated FAQ and our Code of Conduct. In order to encourage good play sessions, during the Open Beta the development team will be exploring a series of measures to ensure fair PvP matches and prevent abusive match-quitting. Hence, players leaving during a round will receive an XP penalty. Moreover, if a team loses the round during which a member left, that loss will still count toward the leaving player’s skill rank. Players can also report quitters for negative behavior and explain the situation to the support team to help us better understand this kind of behavior. Regarding Ghost War, we are looking at working in close collaboration with the community, starting with the Open Beta. Players will be able to report cheaters or players with abusive behavior, in addition to the work already done by EasyAntiCheat. Our support team will issue bans based on tangible proof provided by our own tracking tools as well as other players. The reporting system works for all platforms: PC, PlayStation®4 system, and Xbox One. 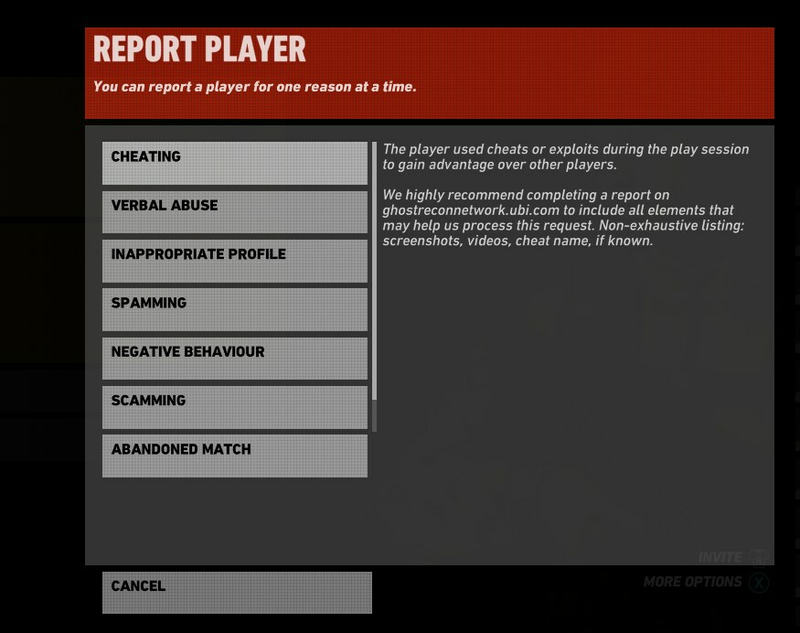 Go on the player’s in-game profile, and report him or her. Be careful though, because in order to prevent abusive reports, you can report a user only once for one reason. Don’t worry however: since this is based on team work, other Ghosts may also report the abusive player. Please note that you can easily find the player you want to report by checking your Recently Played With list in game. Finally, from the Ghost War launch onward, we will improve the player reporting process with the Ghost Recon Network. To report a player, Ghosts will have to use their best recon tools and gather proof of cheating from the suspicious operator; screenshots and videos are the best elements you can use. 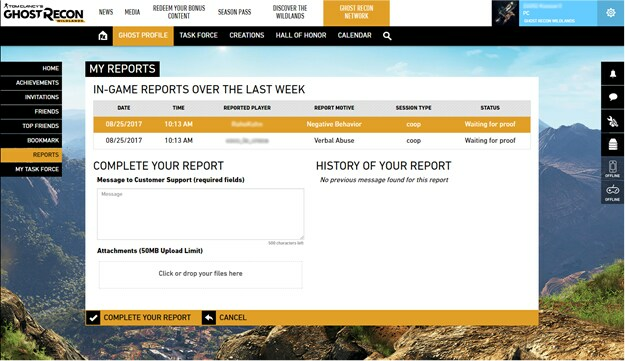 Once the proof has been gathered, connect to your Ghost Recon Network profile, and send your intel to the support team using the Reports section. Please remember that we will add this feature at launch. Finally, please note that if you’re experiencing abusive behavior through a first-party platform tool, you will need to use the first party’s reporting tools. All the elements stated above only apply to the Tom Clancy’s Ghost Recon Wildlands environment (for example, in-game VOIP or chat). We thank you for your understanding. On behalf of the development team, we thank you in advance for your contribution in making the Wildlands a fair area of operations. Don’t hesitate to go on the official forums to provide feedback about your experience regarding anti-cheat, match-quitting, player reporting, or to suggest any other ideas. The Open Beta for Ghost War will take place September 21–25 on all platforms (Playstation 4 system, Xbox One, and PC). For more on this event, go to the official Open Beta portal and be sure to visit our official forums to share your feedback, or join the Ghost War Open Beta discord channel to find other players to play with. Also, make sure to share your Open Beta glorious moments with us by sharing them on Twitter using #GhostRecon or posting on the official forum's dedicated thread. The best streams or community creations will be highlighted on our official channels!